MV Commercial designs, builds, paints and delivers a wide range of tipper grab units available for sale and hire. 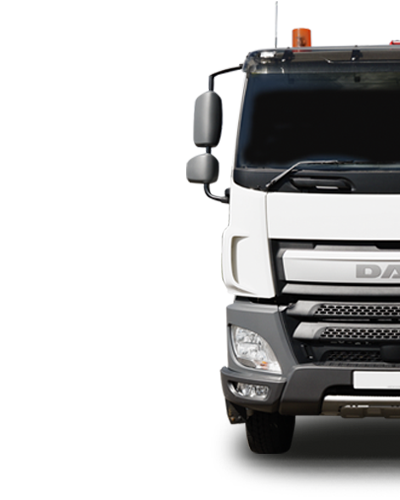 Our ready to go fleet of tipper grab trucks includes the DAF CF, Volvo FMX and Scania G and P Series units and are available across the UK from our depots in Luton, Haydock, Livingston and Poole. Our high specification tipper grab vehicles are built using chassis from several leading manufacturers combined with Thompson Loadmaster Steel bodies, Palfinger Epsilon 125l Crane and a Kinshofer 500l Grab. This winning combination already forms the backbone of many UK fleets. Featuring a wide range of standard and optional features designed to increase safety and driver comfort, these Euro 6 tipper grabs are exceptionally popular among drivers and transport managers alike in a wide range of industries including industrial, construction and timber. Already our vehicles form the backbone of companies helping to build the UK. For more information about our sales and short, medium and long term hire of out tipper grab lorries contact one of our sales team. Efficient and compliance, these Euro 6 tipper grabs save money while protecting the environment. 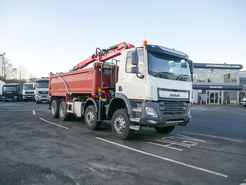 Our most popular tipper grab vehicle, the DAF CF 400 8x4 Day Cab Tipper Grab with 8 Speed Manual Gearbox, has already proven its reliability across the UK in several leading businesses. With a heavy duty design and a full range driver convenience features, this tipper grab combination has earned its place among the industry leaders. The mid-level 400bhp engine paired with a 8 speed manual gearbox ensures optimal efficiency while ensure that there is enough power there when you need it. Palfinger Epsilon 125L Crane with 500L Kinshofer Grab. One of the most robust vehicles that Volvo has ever designed, the Volvo FMX 13 420hp 8x4 Day Cab Tipper Grab with 12 Speed I-Shift conquers virtually any terrain with ease. 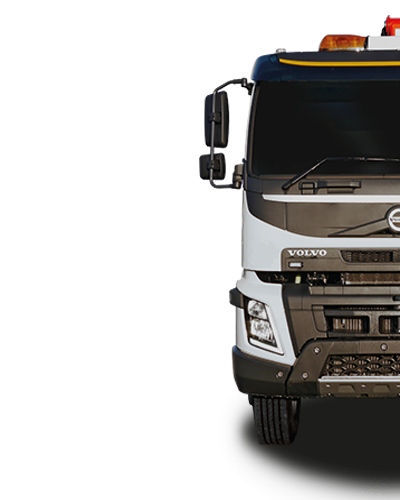 The high ground clearance and bold design makes this one of the most useful and eye-catching vehicles in your fleet. The mid-level 420bhp engine in the Volvo FMX is perfectly suited to the construction and off road application market. 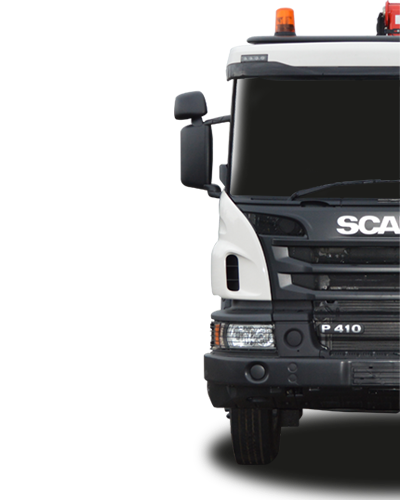 Featuring premium Scania functionality, the Scania P Series 400/450bhp 8x4 Day Cab Tipper Grab with Opticruise or Manual Gearbox offers you a perfect blend of convenience and rugged durability. With a choice of either the P410 or P450, you can balance your fleet to meet your exact needs. The solid steel bumper and solid build makes this vehicle ideal for the most challenging of working environments.